A lot has happened in a short time for Webb Simpson. After finishing second on the 2011 PGA Tour money list and playing in the Presidents Cup, the Wake Forest graduate took further strides into golf’s stratosphere when he claimed his first major championship in June and made his Ryder Cup debut in September. Between those career landmarks, he celebrated the birth of his second child. Dave Shedloski hears how he has kept his feet on the ground during this life-changing period. Webb Simpson skipped the Open Championship at Royal Lytham & St Annes in northwest England this summer so he could stay home in Charlotte, N.C. and be with his wife, Dowd, for the birth of their second child, daughter Willow Grace. The U.S. Open champion might have been absent from the year’s third major championship, but he certainly was not forgotten. Simpson’s come-from-behind victory at The Olympic Club in San Francisco in June had elevated him to No.5 in the world. Simpson has certainly broken through. 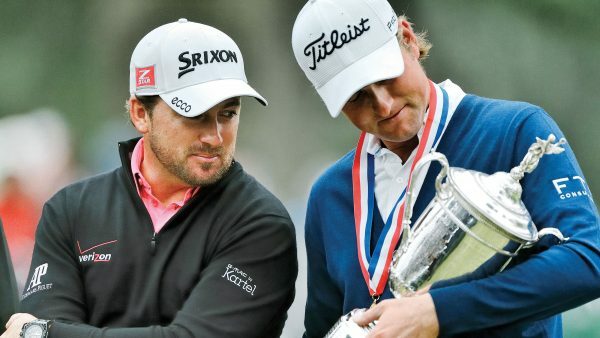 Just one year after an eye-opening 2011 campaign in which he won twice on the PGA Tour and finished second to Luke Donald on the money list, Simpson further burnished his reputation as one of the game’s top players with his U.S. Open triumph. And even though he took more than a month off in the middle of summer, he still reached the Tour Championship for the second year in a row and also qualified for the U.S. Ryder Cup team for the first time. At Olympic, thanks to a pair of 68s on the weekend, Simpson rallied past two seasoned golfers, and former winners, in Jim Furyk and Graeme McDowell to win on his second U.S. Open appearance and just his fifth start in a major championship. He became only the third American to win the national championship since 2004, and is the first player since Jerry Pate in 1976 to win the title at his second attempt. Simpson has risen quickly since he turned professional in 2008 after an amateur career that included victories the previous year in the Southern and Dogwood Amateur Championships. He was a member of the victorious U.S. Walker Cup team in 2007 at Royal County Down in Northern Ireland, and his college career at Wake Forest culminated in three years as an All-American and the accolade of Atlantic Coast Conference Player of the Year in ’08. After reaching the PGA Tour via the Tour school, he earned $1.2 million from his first full season in 2009, displaying a commitment to self-improvement and a healthily competitive attitude. He’s a fast learner but believes he has to be in an era defined by the excellence of Tiger Woods. “I think the game’s changing,” Simpson said. “The Tiger effect of inspiring people to play at a younger age, and the access that players have to golf [at the highest level] has gotten so much bigger, that the game is changing. The prime age of a leading player 10-15 years ago was mid-30s. Now it’s moving closer to the mid or late 20s. There are so many young guys. “If I see Keegan Bradley win a major, I respect his game a ton, but I feel like, Keegan Bradley won one so I want to go win one. All these guys that won before me, I thought I played with these guys all my life. I want to win a tournament. Everybody is so competitive in this world that we just kind of feed off each other. Simpson is evolving, too. He is a man with a strong religious faith and devotion to his family. “When you talk about winning a major, especially the U.S. Open, which is probably the most important tournament an American player can win, you experience the highest form of joy in your profession,” he says. “Even as such, that doesn’t compare to the highest form of joy in your personal life of having children, and my wife and I are very fortunate to have two healthy kids. It appears so. One of the most important undertakings in his professional life has been tweaking his swing with the help of longtime coach Ted Kiegel. He needed it. When veteran caddie Paul Tesori took up Simpson’s bag last year, he was not impressed with Simpson’s unconventional motion. It was simply way too handsy, he said, and he was not afraid to voice his opinion, albeit with the best of intentions. The fact is Simpson does have a strong mind along with a first-rate short game, one that doesn’t merely rely on his proficiency with the belly putter he wields. He has further progressed through a new fitness regimen. But strong mind aside, Simpson gained a newfound respect for Woods, having gone through the grinder of being in contention in a major championship. Simpson’s breakthrough year in 2011, which also included a successful debut in the Presidents Cup in Melbourne, Australia, where he went 3-2 with his three victories coming in team play with Bubba Watson, placed more expectations on him in 2012. But while he had undertaken modest improvements, he’s taken care to not make changes that are overly dramatic or a departure from his core fundamentals. “I knew what would probably come with having a good year like I did last year,” he said. “One thing I’ve kind of noticed with certain guys that have had great years is maybe they change equipment or they change swing instructors. And I wanted to make sure I didn’t change anything. And I wanted to continue with what we call our process, which is that we’re trying to get better. Winning a major championship can change a player, alter his expectations, perhaps even make him overly satisfied and a bit complacent. Or he can go the other way and start expecting too much of himself, trying too hard to live up to the expectations of others. Simpson, who had a so-so Ryder Cup at Medinah, going 2-2 but losing his singles to a fired-up Ian Poulter on the final day, is cognizant of that, which is itself an important step. In winning at Olympic Club and knocking off a couple of former champions in the process, Simpson extended the San Francisco club’s tradition of shepherding an underdog to victory. That tradition started with Jack Fleck defeating Ben Hogan in a playoff in 1955. Eleven years later, Billy Casper knocked off Arnold Palmer in another playoff after Palmer led by seven strokes with just nine holes remaining in regulation. with Palmer as a result of attending Wake Forest on a Palmer scholarship. While Palmer has been an inspiration to Simpson, another Hall of Fame golfer has also had a considerable impact on him. The week before he ventured to San Francisco and Olympic, Simpson warmed up for golf’s toughest test by playing some casual golf for four days with friends in Pinehurst, N.C. Pinehurst has long been a favorite retreat for Simpson, who grew up about an hour from there in Raleigh, N.C. He used to make the drive there for weekends for golf, and when he was 13 years old, he served as a standard bearer during the 1999 U.S. Open over the No.2 Course. One of the players whose name he carried was 1982 U.S. Open winner Tom Watson, who offered him some sage advice that week: every tournament is a level playing field, so keep working hard. “I’ve never forgotten that,” Simpson said. As fate would have it, the national championship returns to Pinehurst in 2014. Simpson can’t wait. But this time, his name will be on one of the standards. He’ll be introduced as a U.S. Open champion.